Welcome to my website. Please follow the links to learn more about me, my classes and workshops on Living and Leaving Your Legacy® as well as my journaling, Room 732, and the project I am currently working on. If you are interested in attending a legacy class or would like to engage me as a speaker, please contact Merle R. Saferstein at merles1212@gmail.com or fill out the contact form. For over forty years, I have kept journals. Over a period of fourteen years, I went back through my journals, read them, and took excerpts from these 360 journals on approximately seventy topics. I am currently beginning to write a series of books using these excerpts. Please watch this video which explains why my journals will become my legacy. I am facilitating a writing workshop, The Women’s Writing Connection, at Gilda’s Club, a cancer support community, in Ft. Lauderdale. The class takes place the second and fourth Thursday of every month. For anyone who is currently affected by cancer or knows someone who is and might like to join us, please call 954-763-6776. Room 732 has been selected as a B.R.A.G. Medallion Honoree! 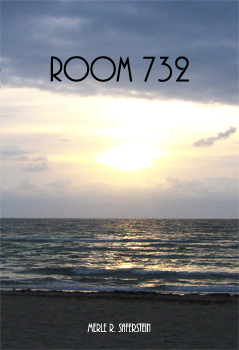 Room 732 takes place at the Hollywood Beach Hotel in South Florida during the years 1934 to 2012. Woven into stories of love and human connection, all of which take place in Room 732, you will meet two strangers who become friends, a seasoned Naval officer who is preparing sailors for war, and a young married woman who explores her innermost thoughts. You also will encounter a divorced father who is spending time with his daughter after a long absence, two cousins who have come to the hotel on a special mission, and many other individuals who have stories to tell. Click here to order the book on Amazon.com or BarnesandNoble.com. On May 2, 2016, my article entitled Jumping for Our Legacy appeared on the Huffington Post. The contents of this site are Copyright © Merle R. Saferstein. Living and Leaving Your Legacy® is a Registered Trademark of Merle R. Saferstein.